The Libyan Seaturtle Program LibSTP (an initiative coordinated through the Environment General Authority (EGA) of Libya since 2005), recently established an activity aiming to educate school children and teachers about the endangered species of the Mediterranean Sea. 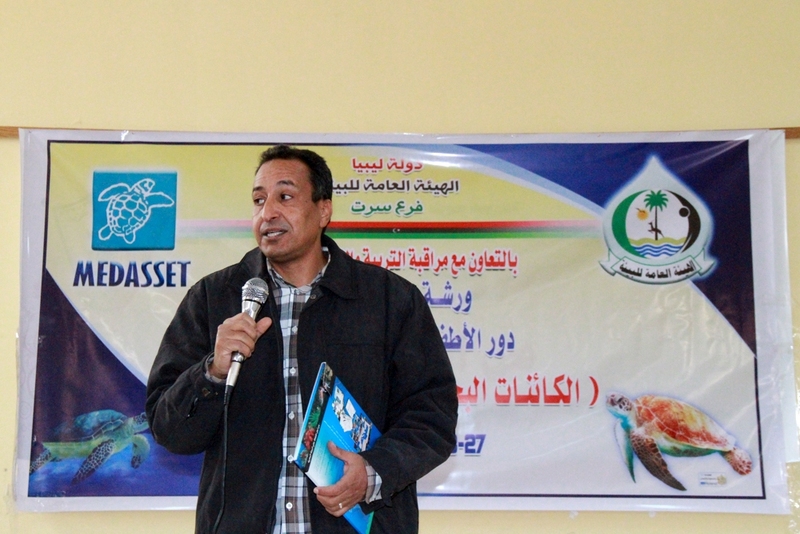 To this end, a two day environmental education workshop was organized in the city of Sirte, between 27 and 28 of January 2015. Activities of the workshop drew their inspiration from the Arabic version of MEDASSET’s educational kit: “The Mediterranean Sea, a Source of Life”. *MEDASSET and The Libyan Seaturtle Program (LibSTP) would like to thank Ms. Johana Hancock for her brilliant efforts, and everyone who donated to the programme during the 35th ISTS. In 2002, an original environmental education kit “The Mediterranean Sea, a Source of Life,” was designed and printed by MEDASSET in collaboration with the Hellenic Childrens’ Museum and Kaleidoscope Publications. Intended for dissemination to schools and youth groups, both Greek and English editions were produced with funding from the Niarchos Foundation. The kit aims to engage 6-12 year old children from all over the Mediterranean region in creative activities, instilling knowledge, environmental values, and a sense of regional identity and responsibility. It has proved a useful tool for teachers and educational group leaders. In 2005, following the success of the Greek and English editions, and with funding from UNEP/MAP in Greece, RAC/SPA (UNEP/MAP) in Tunisia, the Niarchos Foundation and the Prince of Wales Foundation (UK), the kit was adapted, translated and reproduced in Arabic and was disseminated to schools bordering the Mediterranean. Since 2012, the Arabic version of the kit has been available online as a free download at www.medasset.org.